Today I'm pleased to have writing duo Amie Kaufman and Meagan Spooner here to discuss THESE BROKEN STARS a sci-fi epic coming from Disney-Hyperion in Fall 2013. 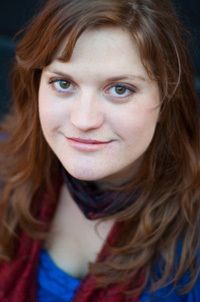 Meg: I went to this completely awesome workshop called Odyssey a few years ago and we talked a lot about genre there. One of the things I found fascinating was the idea that fantasy and horror let us "rehearse" our fears in a safe way... as in, we experience them through the stories and "survive" them, in a way. I think people are drawn to darkness for the same reason they're drawn to fire--deadly can be hypnotic. Amie: Just between you guys, the Internet and me, I'm kind of a happy endings girl, while Meg was once described by her editor (in public!) as "up to her elbows in viscera". I think she's dead on, though. Dark stories let us feel dread, be thrilled, then come home safe. Meg: I actually think this is one of the things that make us a good pair. You keep me light and I keep you dark. You’ve got to have the up and down in a story, the highs and the lows, or else it’s just unrelenting kill-me-now awfulness. Amie: Yeah, you want that stuff to relent every so often. Just a bit. Amie: Ooh, ooh, I know. It's Open Your Eyes by Snow Patrol. That song captures the desperation of Tarver and Lilac's situation, that us-against-the-world quality to their story. Meg: AGH, you stole mine! I don’t think we can be friends anymore. Amie: Think of it more as... collaboration. Go team! Meg: I totally agree, though. That song just has this energy, this buildup… the lyrics are all about trying to get someone to open their eyes and SEE what’s really going on. 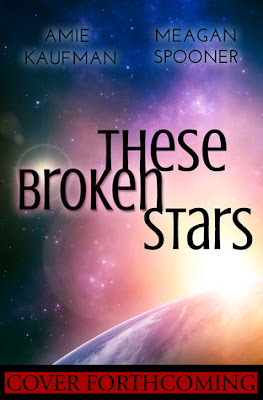 Which works for THESE BROKEN STARS on soooo many levels, not just the romance aspect. Meg: Oh, this is such an easy question for Lilac. Well, actually not so much a fictional character as a historical one… but Lilac would totally pal around with Marie Antoinette, don’t you think? Amie: !!! Oh, she totally would! Marie Antoinette had a fake village built, with sheep carefully washed and perfumed, and properly clean villagers so she could play at the country life. Lilac has always been similarly distanced from the world--in These Broken Stars, she's forced up close to all that reality. Also, Lilac and Marie Antoinette would totally swap fashion tips and talk hairstyles. Meg: Especially in the beginning of the book, Lilac is all about the dresses, the dancing, the drinks and delicacies. Amie: As for Tarver, he'd share a drink with Captain Mal Reynolds of Firefly (TV). They're both rough, practical soldiers of no particular breeding and highly likely to put their foot in it if they're let near the gentry, but there's poetry in their souls. Amie: First pick for me is Under The Never Sky by the incredible Veronica Rossi. There is SO much to love in that book--the characters that grabbed me and pulled me in (I have a Roar crush), the way she plunges you into the world she's built and forces you to run to catch up, the layers of plot that peel away to leave you going "No, no, OH NO YOU DIDN'T." Meg: Oh man, I LOVE that book. I have a major Roar crush too. Sooo good. My top rec is easy, because it’s one of my favorite books of all time: The Giver, by Lois Lowry. It’s such a beautiful, beautiful book. The writing is lovely, and the vision of mankind’s future is both bleak and hopeful—a vision of everything we’ve given up in the name of fairness and equality, and everything one boy’s willing to do for the chance to get that back. So gorgeous. Amie: One of the many things I particularly love about The Giver is that I've read it many times over the years at different ages, and found a different story every time. I'll add Scatterlings by Isobelle Carmody, an Australian author. It's about a girl who wakes up with no memory of who she is, to find that the world she remembers is now ancient and decayed, highways grassed over, skyscrapers crumbling, survivors ruled by a group called the Citizen Gods. Meg: You keep telling me to read Isobelle Carmody. One of these days I’ll actually get around to it! Okay, I’ll say the obvious one: The Hunger Games, by Suzanne Collins. I feel like that’s a new classic, really—the series that really jumpstarted the current dystopian craze. Plus it’s just awesome. Amie: Awesome in so many ways. Even leaving aside the things I love about the writing, I love that so many people I know from all walks of life are reading it, and I love seeing folks who'd usually never come together on books arguing about it. I'll round us out the The Handmaid's Tale by Margaret Atwood, which I think is one of the most haunting and beautifully written books I've ever read. Amie: I'm always on the move—I've traveled by plane, train, bus, camel, bike, motorcycle, horse, foot, sailboat, kayak and most other ways you can think if. Before I check out, I'd love to take the Trans-Siberian Railway, live in Vernazza, Italy for a while and see some of Africa. I was so inspired by Meg's recent trip there! Meg: Mine’s all about travel, too. I desperately want to see Asia—I’ve never been to China, Japan, Vietnam, India. I’d love to go. And like Amie, I’m envious of her travel… she’s been to Vietnam several times, and it sounds so lovely. Meg: Well, THESE BROKEN STARS isn’t a dystopian—at least, not in the strict traditional sense. The shape of the series as a whole definitely has dystopian elements… the universe is run by unscrupulous corporations, and our heroes and heroines have to work to take them down. But it’s also very much a science fiction series, and not just the post-apocalyptic kind of sci-fi. We’ve got spaceships and other dimensions and terraforming and all sorts of things you don’t normally see in dystopian fiction. And if that we’re enough, in addition to the science fiction and dystopian elements, TBS is also a survival story. And that’s where the heart of this first book lies—in the way these two survive in conditions they were never meant to face. We love that kind of story. 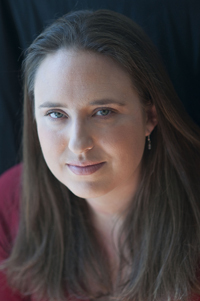 Amie: I've always been a real geek about survivalist stories that explore the way people keep themselves alive, and even transform themselves when disaster hits. From Robinson Crusoe to the journey across a post-apocalyptic America in Stephen King's The Stand, I was always that kid going "okay, so what are they going to eat?" I don't think a lot of SF features situations like this -- even when we're talking about colonizing planets, there's usually equipment in the wilderness. Tarver and Lilac have pretty much nothing, unless you count each other. And at least at first, they sure don't! And bonus question: Why'd you decide to write this novel together? Meg: We’ve been writing together for years, ever since we met—the original foundation of our friendship was writing together. And we’ve always written couples, and alternating points of views and characters. It was always just for fun, never with any end goal in mind. It certainly never occurred to us to publish our collaborative work. But it was around the time when I signed with my agent for SKYLARK that we suddenly realized that maybe it was worth exploring, and we started turning our just-for-fun ramblings into a more cohesive whole. It helped that we met another pair of fantastic collaborative writers, Ellen Kushner and Delia Sherman, at World-Con in Melbourne that year and listened to them talk about their process. The only thing holding us back from trying it was the fear it might hurt our friendship to become professional partners—but meeting them really gave us the courage to give it a shot. Amie: Writing with someone else has the potential to be a disaster, but if you're really in tune--and we've spent years practicing--then it means that you've always got someone there to change you, encourage you, share the awesome moment and pick you up when you need it. Also, our different timezones literally mean you wake up, and it's like elves worked on your book for you overnight! Amie: Lenore, thank you SO much for having us! Meg: Yes, thank you! It’s been so much fun. Thank you two - after this interview, I am DYING to read THESE BROKEN STARS! I am now looking up this awesome song by Snow Patrol, which I have never heard before ( I know, I know, where have I been?) This was such a great interview because it was like sitting down to eavesdrop on a conversation between two very creative friends. I loved this post. Thanks for putting this out there today!